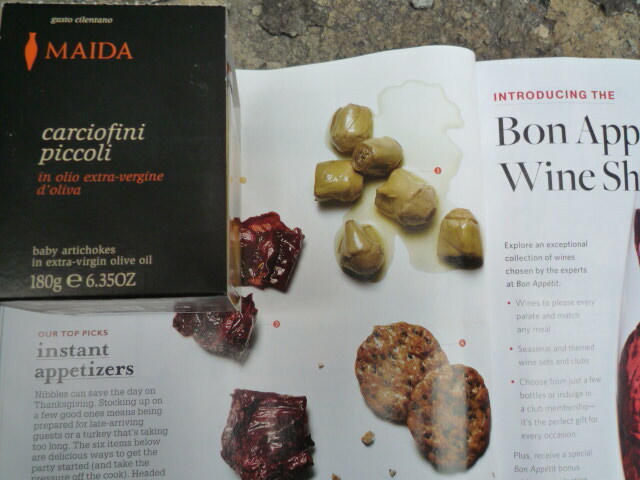 Maida’s carciofini (small artichokes) were featured in Bon Appetit magazine, November issue now on the stands. At left the magazine and the actual jar, in an artistic setting outside the warehouse. It’s always a good thing when an editor likes your product. Our luck that she writes for a magazine that is still alive. The article mentions the Small Artichokes as perfect nibbles/instant appetizers that can save your day on Thanksgiving. OMG, we are already at Thanksgiving! Francesco Vastola, the maker, calls them “carciofini piccoli”. The word “carciofino” already translates into “small artichoke”. So how should we translate “carciofini piccoli”? Small small artichoke? Double small artichoke? Previous Post Whole Fish in Crosta di Sale – A Recipe Anybody Can Do. Next Post Food Inc. Where Is It? Why Is It Not Showing Anymore Anywhere?